Two reasons Michael. One, of course you know the organization has to take its cut as well as pay for product. The second one is that is the only way many Girl Scout troops have of making money to fund their projects. I too think the price is a bit excessive though. I guess any organisation that markets a product to raise funds is going to want to maximise their returns! The question those that think the price is high should ask them selves is are they prepared to donate to that organisation without purchasing goods from them! If the answer is yes then just donate, if no then what are you moaning about and that of course holds true for any charitable cause you care to mention not just the scout movement! There is no compulsion to donate to any charity or buy it's goods! Compulsion comes with our taxes when we are forced to donate to rich bankers and big business etc in the form of bailouts and subsidies for some pretty disgusting activities from torture and war to pollution and animal cruelty at our expense! A legitimate gripe in this particular case would be the source of the ingredients and their potential harm to the environment as to the obesity factor that is in the control of the eater like computors being fed a diet of wrong information they will spew it out out as gospel and likewise the human or animal body will bulge if filled with junk or excessive food! As to the manifold reasons behind why we do that one would have to look at each individual for an answer and the complexity of human behaviour is not something that can be addressed in a few words! Actually, we don'r get those cookies in the UK or if we do I have never seen them. But to add, if no one buys the cookies then they will have to change the ingredients. I suggest do a boycott on the cookies and if you feel bad about not donating to the cause then send the money directly. With fund-raising, unfortunately, it's much more expensive than the regular cookies. At the store, you pay around the same for a box of Oreo cookies, and you get at least 30-33 cookies in there. Well, the profits are minuscule. So, to make it worth while, the fund-raising items end up giving you half the amount rather than double the price, and make them taste extra good to make up the extra. I do wish they'd change the ingredients, maybe we should do a letter writing campaign to the Girl Scouts of America. I like supporting the group because it's a good group, but, I can't have the cookies if they're killing off other species and clogging my arteries at the same time. I prefer fair trade over charity...Either just donate money, or buy the products with reasonable prices. Reasonable and fair price might be a bit higher than commercially produced goods, though. I think the Girl Scout organisation could make a difference by not using palm oil. it would be hugely educational for their members to learn why they are doing it and the benefits of stopping doing it. the publicity would educate the general public too, and raise publicity for the cookie selling. Don't complain about GS cookies prices and sizes. The Thin Mints are now being produced by Back to Nature 1 oz smaller and $4.99 per box so $3.50 is great! NETX the price is $3.50 fixed! I would appreciate it if everybody would demand a dairy free (no whey) and glue tin variety! My girls sell the cookies and can't even eat them! We have so many people in this country with these issues both health and spiritual that demand no dairy or no gluetin. It's time for a change! total sucker for the dollar candy bar sales! Much easier to devour right on the spot than slinking off and pouncing on a box of cookies! Right out of the wrapper, through the lips and onto the hips! I hope these problems can be resolved. 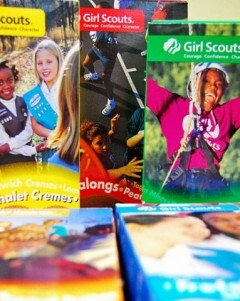 I'm always happy to support the Girl Scouts. Unlike their male counterpart, they don't discriminate against anybody. Pressure should be put on GS to discontinue the use of palm oil.